Urethane, often called polyurethane, is a versatile substance that has many applications in manufacturing, construction and art. Used for things as diverse as housing insulation and computer parts, it can be shaped by pouring it into a mold and allowing it to cure. Urethane is actually a combination of two somewhat hazardous and volatile substances, which, when they react, form a safe and inert final product. For this reason, safety precautions must always be followed when pouring urethane. Don safety gloves, protective clothing and a filtered mask. Place a measuring cup on top of a paper towel on an electronic scale and zero out the scale. The paper towel is to protect the surface of the scale from spills. Shake a closed container of urethane hardener thoroughly and pour the desired amount into the measuring cup on the scale. Note the scale reading and zero out the scale with the filled cup still on it. Calculate the weight of urethane resin that will be needed to reach the mixing ratio recommended by the urethane manufacturer. For instance, if the urethane hardener weighs 5 oz., and the ratio of hardener to resin is 5:1, you will need to add 1 oz. of resin to the measuring cup on the scale. Shake a closed container of urethane resin and pour the amount you calculated into the cup on the scale. When the scale reading gets close to the amount you need, stop and pour some resin into a second small container. 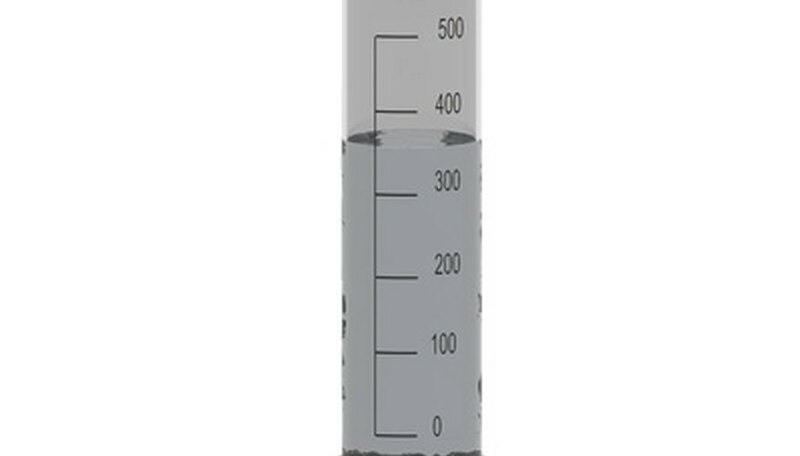 Use an eyedropper to transfer the final, tiny amount of resin from the small container to the container on the scale until the correct weight is reached. Stir the mixture of resin and hardener with a glass rod to mix it well. Place the mold into which you will be pouring the urethane, along with the measuring cup of urethane mixture, into a vacuum chamber and seal it. Lower the pressure in the vacuum chamber to 27 mmHg below atmospheric pressure for at least 30 seconds to remove gas bubbles from the urethane and the mold, then bring the pressure slowly up to normal. Remove the mold and the container of urethane from the vacuum chamber and pour the urethane into the mold. Return the filled mold to the vacuum chamber and once again reduce the pressure to 27 mmHg below atmospheric pressure for at least one minute or until no more bubbles are visible in the urethane. Raise the pressure to 5 mmHg less than atmospheric pressure and allow the urethane to cure for two hours. Raise the pressure in the vacuum chamber to normal and remove the mold. Remove the urethane from the mold. Place all contaminated equipment and supplies, including cups, paper towels and safety equipment, inside a sealed plastic bag. Place the sealed plastic bag inside a second sealed plastic bag. Dispose of the bag as hazardous waste. Wear two pairs of safety gloves. Use the outer pair when handling the urethane precursors and the inner pair for other procedures like adjusting the vacuum chamber. This will reduce contamination in the lab. Both urethane resin and hardener produce dangerous fumes and have been shown to be carcinogenic. Good safety procedures are vital when pouring urethane.